Frank Sinatra, Gene Kelly and Jules Munshin in On the Town. Bobby-soxer-turned-blue-haired-matron idol Frank Sinatra will have his “Summer Under the Stars” day on Friday, Aug. 28. Turner Classic Movies will show twelve of the actor-singer films, the best of which is On the Town, a zesty musical about three sailors and their three girls (four, if you include Alice Pearce) spending a day together in New York City. The three guys – Sinatra, Gene Kelly, and Jules Munshin (above) – are all likable and fine, but it's the female quartet that does it for me: in addition to Pearce, there's Vera-Ellen, Betty Garrett, and Ann Miller. In my view, those women are the ones who should have been the superstars of Hollywood musicals of the '40s and '50s. 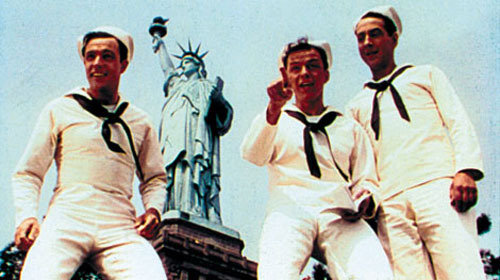 Anyhow, Kelly and Stanley Donen co-directed On the Town, while the Alfred Green-Betty Comden duo penned the screenplay, which in turn was based on their Broadway musical. Two other Kelly-Sinatra vehicles, the Academy Award-nominated Anchors Aweigh and Take Me Out to the Ball Game, are pleasant musicals that were well-received at the time. On the other hand, The Kissing Bandit, which pairs Sinatra with Kathryn Grayson (the leading lady in Anchors Aweigh) was reportedly a major flop. This so-so musical is enlivened by the hilarious Mildred Natwick in a supporting role, and by a fiery dance number performed by Ricardo Montalban, Cyd Charisse, and Ann Miller. The World War II melodrama Never So Few, which stars Sinatra and Gina Lollobrigida, is quite likely director John Sturges' worst film (though I still haven't sat through Sturges' Gunga Din remake Sergeants Three, also listed below); the musicalized comedy-drama The Tender Trap has less of interest to say about male-female relationships than Cecil B. DeMille's silent melos of the 1910s; while Vincente Minnelli is incapable of keeping the phoniness at bay in Some Came Running, an overripe melodrama based on James Jones' semi-autobiographical novel; the film is made tolerable by Martha Hyer's class and by Shirley MacLaine's kind-hearted (and, as usual, thoroughly desexualized) floozie (above). High Society has loads of fans; in fact, this musicalized The Philadelphia Story remake was MGM's biggest hit of 1956. Directed by usually reliable Charles Walters, High Society is pleasant to look at (cinematography by Paul Vogel) and it offers a couple of good Cole Porter compositions. Having said that, I gotta add that instead of sitting through a romantic comedy boasting all the natural lightness and charm of a metallic butterfly, I'd much rather rewatch genuinely sing-songy, uplifting fare like, say, Carl Theodor Dreyer's Day of Wrath or Bruce LaBruce's Otto; or Up with Dead People. I've never seen Higher and Higher, but since Michèle Morgan is in it, it's definitely worth a look. Servants pass off one of their own as an heiress in hopes of winning her a wealthy husband. Cast: Michele Morgan, Jack Haley, Frank Sinatra. Dir. : Tim Whelan. Black and white. 90 min. Fly-by-night producers dodge bill collectors while trying for one big hit. Cast: Frank Sinatra, George Murphy, Gloria DeHaven. Dir. : Tim Whelan. Black and white. 88 min. A timid young man is forced to follow in his father's footsteps as a notorious masked bandit. Cast: Frank Sinatra, Kathryn Grayson, J. Carrol Naish. Dir. : Laslo Benedek. Color. 100 min. A pair of sailors on leave try to help a movie extra become a singing star. Cast: Gene Kelly, Frank Sinatra, Kathryn Grayson. Dir. : George Sidney. Color. 139 min. Three sailors wreak havoc as they search for love during a whirlwind 24-hour leave in New York City. Cast: Gene Kelly, Frank Sinatra, Vera-Ellen. Dir. : Gene Kelly, Stanley Donen. Color. 98 min. A beautiful woman takes over a turn-of-the-century baseball team. Cast: Gene Kelly, Frank Sinatra, Esther Williams. Dir. : Busby Berkeley. Color. 93 min. A U.S. military troop takes command of a band of Burmese guerillas during World War II. Cast: Frank Sinatra, Gina Lollobrigida, Steve McQueen. Dir. : John Sturges. Color. 125 min. A veteran returns home to deal with family secrets and small-town scandals. Cast: Frank Sinatra, Shirley MacLaine, Dean Martin. Dir. : Vincente Minnelli. Color. 136 min. In this musical version of The Philadelphia Story, tabloid reporters invade a society wedding. Cast: Bing Crosby, Grace Kelly, Frank Sinatra. Dir. : Charles Walters. Color. 107 min. A swinging bachelor finds love when he meets a girl immune to his line. Cast: Frank Sinatra, Debbie Reynolds, Celeste Holm. Dir. : Charles Walters. Color. 111 min. Three adventurous Cavalry officers and their bugler take on a renegade chief. Cast: Frank Sinatra, Dean Martin, Sammy Davis, Jr. Dir. : John Sturges. Color. 113 min. Gunmen take over a suburban home to plot a presidential assassination. Cast: Frank Sinatra, Sterling Hayden, James Gleason. Dir. : Lewis Allen. Black and white. 76 min.